This is it. Your time to shine. Rather than listing the most likely questions that will come up in your interview (because no one can be entirely sure of that) we’re going to gift you some advice that you can be proactive with. 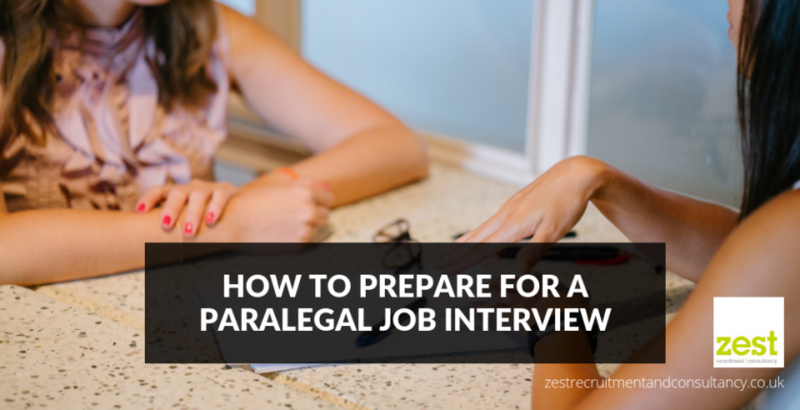 Whether being a paralegal is a stepping stone in your legal career or somewhere you want to stay, these insights will give you the best chance of securing employment in the competitive landscape. As you should already know, a paralegal should always be the first on the scene, ready to help and support. This should reflect in your interview. Arriving early indicates good character, punctuality, and it also gives you time to compose yourself, so you’re calm and prepared to answer questions and give the best impression. You may have been studying your law degree, or perhaps you’re just looking to enter the world of law, and now is your moment, so don’t be shy about it. Have confidence in your abilities. The lawyer you’ll be supporting needs to know that they can rely on you and not have to worry. Your composure and belief in your answers and research can show them this. Be sure not to be so over the top that your perceived as cocky, just make a strong enough impression that will last. Sometimes, it’s best to let your work do the talking. Bringing along crisp copies of some of the work you’ve done in the past is always a good idea. Showcase your administrative abilities and let them know of any time-management experience you may have had. These could be what set you apart from your competition. And if this is your first role, copies of academic work can also showcase your skills and industry knowledge. Either way, bringing this evidence along will show professionalism, pride in your work and will therefore make you more memorable. As well as presenting your hard skills in the interview, it’s also important to highlight your soft skills too. With this in mind, avoid just listing all the skills you think you have. Showing how you can prioritise tasks, your extensive organisational skills and how you ensure work is completed accurately, are all skills needed in a paralegal career. With each attribute you wish you highlight, it should be followed by an example of when you’ve done it or used the skill in order to get something completed. Assuming the employer will just trust you have these skills is naïve, and without a proper explanation of when you’ve actioned your abilities, it’s just a moot point. Yes, you’re probably prepared to be asked a range of questions at your interview, but do you know what you could ask your interviewer? It’s an absolute requirement to research the firm beforehand, having a set of questions to ask post-interview is good proof of your commitment. Asking about any prospective training opportunities shows that you have ambition and are serious about your legal career. Is the interview going well? Try asking for a short tour of the firm. This will not only give you an idea of the working culture, but you can also get the opportunity to meet your potential colleagues – so, make your first impression count! Showing a keen and positive interest in the firm you interview for will make you more memorable. It also benefits you in a sense that it will clear up any hesitation or doubts you may have. Remember an interview isn’t just for you to impress the firm but it’s also an opportunity for you to get a true sense of fit, culture and suitability. Whether it’s starting your paralegal career or moving to the next step on the ladder, you want to make sure you can see yourself excelling within the firm. Ready to apply for your next paralegal role or any roles within the legal sector? Let us help you to take the next step in your legal career, upload your CV and have a browse through the roles we’re currently recruiting for. What could be the impact of a digital disrupter in the legal sector? How to prevent pregnancy discrimination within your workplace?